German painter, active in Italy and Austria. He was first trained in Hamburg by Dietrich von Sosten (fl 1669; d 1695) and Johann Joachim Pfeiffer (1662-1701). Although he initially leant towards historical painting, later he painted only still-lifes. Resident in Rome from 1685 to 1695, he was introduced into the city s Flemish/Italian circle of artists by Gaspar van Wittel. 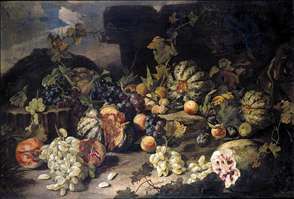 He worked occasionally with Pieter van Bloemen and Carel van Vogelaer (1653-95), then became a follower of Carlo Maratti, who painted the figures in his still-lifes. Through Maratti he gained commissions from the Roman patrician families, and their patronage made him known in Spain, France, England and Germany.